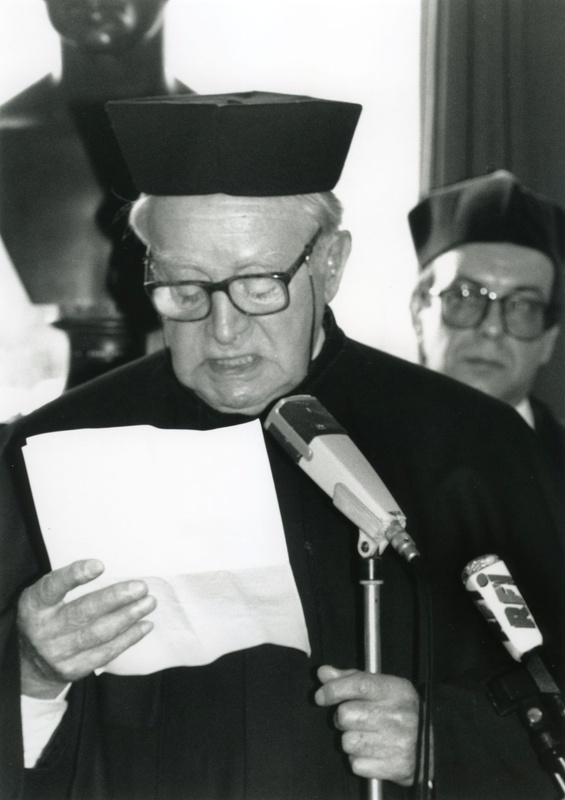 On the 9th of November 1991 a ceremony was held in the Polish Library in Paris at which the Jagiellonian University of Kraków conferred upon me the honorary degree of doctor honoris causa. I would like to thank the Library and its Director Mr Andrzej Krzeczunowicz for graciously hosting the ceremony, which I found truly moving. The fact that it could be held in a building which had stood witness to the Wielka Emigracja of the 19th century imbued the event with an added sense of gravity and meaning. The Jagiellonian University was represented by its Rector – Professor Andrzej Pelczar, by Professor Franciszek Ziejka, Dean of the Department of Philology who read the Eulogy, and by Profesor Jan Błoński, the Promoter of the Degree who read the Validation in Latin. Professor Folkierski and Professor Pelczar offered the opening remarks. One of my guiding principles in life has been never to accept awards or distinctions. However, when I received the Jagiellonian University’s honoured proposal, it came to me how many and wide-ranging are my ties to the City of Kraków and to its University. First and foremost in my juxtaposition of contemporary Poland with the Poland of some six hundred years ago. Our country, which was then under threat from its powerful neighbours, torn asunder by regional rivalries and the rivalries of its grandees, was suddenly transformed into a power which, for a time, came to command influence in Europe and shape its destiny. This was the making of the Cracovian Lords, who had a vision of what Poland could be, a vision not devoid of risk, but one which was squarely based on the realities of the day. When I ponder current Polish realities, I see a country governed by small, shallow individuals who lead Poland from calamity to calamity, but at the same time I see greatly favourable and auspicious circumstances, not given to us for centuries, now opening up before us. I can thus but return in my thoughts to those Cracovian Lords. Think not, however, that I am a complete pessimist – I look with hope to the younger generation, a generation not poisoned by sovietisation, to whom all this post-“Solidarność” bickering and feuding will be pre-history. And the Jagiellonian University, with its stubborn defence of humanity’s true values, has a formidable role to play in the shaping of this generation. One has only to remember the position adopted by the University in the context of the so-called “Jędrzejowicz reforms” before the Second World War. Professor Stanisław Kot, who lost his Chair as a result of these reforms, was a bad politician, but a very fine scholar, and the Jagiellonian shielded and defended him from the harassment and repressions meted out to him. Think also of the stance adopted by Professor Krzyżanowski, who honoured me with his friendship, in the face of the creation of the Brześć Prison. In condemning it, he sacrificed a substantial political career, for he was to become our Minister of Finance and responsible for the reform of the Polish economy. Remember too, how the Jagiellonian professors stood up to the Nazi occupation. Today Kraków is perhaps the most significant cultural centre in Poland, a very hive of intellectual activity, with new ideas and intellectual currents, new journals and publishing houses, all coming into being – and all of this mainly centred on the Jagiellonian University. I myself have a family connection with the University. I am very proud that among the first students of the University, during its early flowering many centuries ago, there were Giedroyces from far away Lithuania, and that in Kraków there is still the “Giedroycianum” housing the mortal remains of the Blessed Michał Giedroyc, also connected with the University, who represents, as it were, a buckle fastening together the Grand Duchy of Lithuania with the Kingdom of Poland. A great many contemporary Lithuanians would, I think, wish to see Blessed Michał raised to the altars, which in turn would do much to improve Polish-Lithuanian relations which are currently in a state of crisis, so harmful to both sides. But these are essentially themes from a bygone age. May I just add that I also have a personal link with the Jagiellonian. When in the 1930s I was creating the first journal I was to edit, my closest collaborators were mainly alumni of the University: Ksawery Pruszyński, Wacław Zbyszewski, Kostek Łubieński, Miś Tyszkiewicz and others.